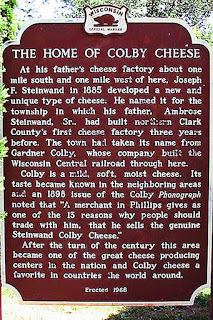 Joseph F. Steinwand invented Colby cheese in 1885. 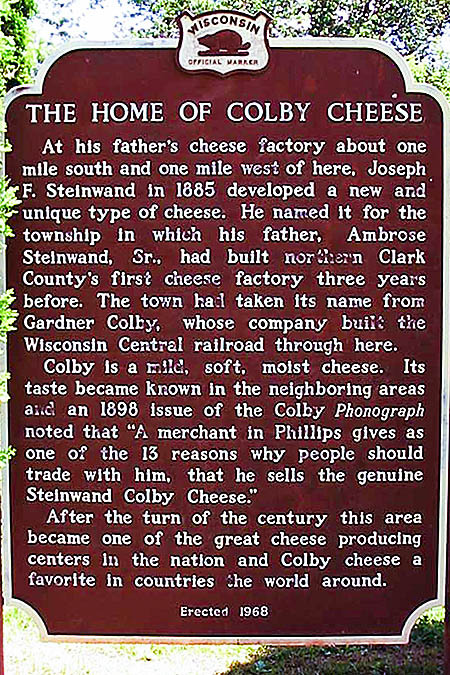 He named the cheese after Colby, Wisconsin (United States) – where his father Ambrose Steinwand Sr. had built the first cheese factory in Clark County (a township in Colby) in 1882. This cheese factory was a simple, small wooden building that produced around 125 pounds (57kg) of cheese each day. Joseph began helping his father in the cheese factory when he was 16 years old, learning how to make cheese. His father sent him to a cheese-making course and upon returning, Joseph began his cheese experiments in the factory. Small, simple changes led to a milder, softer cheese than cheddar and Colby cheese was born! Colby cheese is a semi-hard cheese made from pasteurised cow’s milk. Colby cheese was originally called Colby Swiss Cheddar and is often compared to cheddar cheese; however they are both different in flavour and texture. Colby is milder in flavour and creamier in texture and has a higher moisture than cheddar cheese. Colby cheese also does not undergo the cheddaring process, instead involving a washed curd process that makes the cheese less tangy due to the lower acid content. Colby cheese is aged for only a few months before consumption – it becomes cracked and dry if aged too long. Some cheese-makers like to blend Colby with other cheeses i.e. jack cheese. Old-fashioned Colby cheese was made in a 13 pound (6kg) longhorn shape (a tall cylinder) that was then waxed and sold. Modern cheese factories make Colby cheese in blocks of around 40 pounds (18kg) that are closer to a mild cheddar. Modern Colby cheese is made quicker and is less sweet than the original Colby cheeses. The curd washing process has also changed: the traditional method was to reduce the whey down to the curd level, then washing the curds with filtered water to cool them, when the curds were around pH of 6 or higher. Then the curds were rested and stirred for 15-30 minutes before draining, salting and pressing. Modern Colby cheese is made by dropping the pH to 5.6, with no resting. The reasoning for this is that modern large cheese factories are reducing the water and whey processing/handling – plus heating milk to a higher temperature, adding extra rennet and cutting the curds finer reduces the Colby cheese-making process to around 2 hours. Colby cheese goes well in toasted sandwiches, burgers and with fruit such as apples and. Colby cheese is commonly accompanied by wines such as Shiraz or Cabernet Sauvignon.